The mission of Lernabit is to make education better and more accessible by leveraging technology. I strongly believe that the best way to achieve that goal is by providing educational content in audio format. Up until now, Lernabit has been focused on the accessibility angle, and I have done this by distributing free educational mini-lectures. Audio content is accessible while doing other things at the same time, making education accessible from the perspective of time. Meanwhile, making them freely available has made it possible for anyone to access educational content regardless of income. Today, I am excited to announce a new feature that takes the first step toward making education more effective. The new feature is called "Remembered Bits", and it will change the way you study and retain information. When browsing Bits, you will now notice a new button that says "Remember". When you click that, the Bit will be added to your list of Remembered Bits, and that is where the cool part happens. The "Remembered Bits" feature is not just a "Like" or "Favorite" button like on many other sites. Instead, the Remembered Bits feature will actually help you remember the information in that Bit using a spaced repetition algorithm. According to research, memory retention is improved when you study at gradually increasing intervals rather than repeatedly cramming the information at regular intervals. It is believed that that this technique is beneficial because rather than repeatedly reviewing the information at a superficial level, it provides more time for the brain to process the information at a deeper, conceptual level. This study technique is known as "spaced repetition", and the Remembered Bits feature on Lernabit utilizes such an algorithm. When a Bit is "Remembered", it will be issued a review date. When that date is reached, you will receive an email letting you know that it is time to review it. Then, it will calculate a slightly longer interval, set a new due date, and notify you again when the new due date is reached. At first, the interval will be very short (initially 1 day), but will gradually increase to weeks, months, or even years. Note that the due date is only updated if the current due date is in the past. In other words, if you listen to a Remembered Bit that isn't currently due for a review, the current due date will remain unchanged. This is by design so that the due date is not pushed further into the future every time you listen to it. Otherwise, listening to a Bit multiple times in the same day-- such as when studying for a test-- would quickly push the due date months or years into the future. In short, this feature is designed to improve long term retention but also to get out of the way if you do need to cram. This leads to the next announcement I have today. 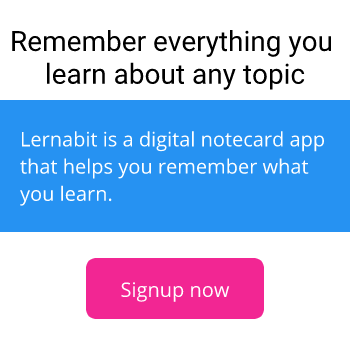 I'm introducing a new Premium version of Lernabit. The Premium version is a paid plan that offers additional features. The Remembered Bits feature is the first feature exclusive to the Premium plan. In addition, Premium members don't see any ads on the site. The ever-increasing usage of ad-blockers and decreasing effectiveness of advertising has made it very difficult to build a great product without an additional source of monetization. The addition of a Premium plan is part of my goal to turn Lernabit into a sustainable tool that will be around for many years. The price of the Premium plan is currently set at $8 per month, which is comparable to the monthly cost of Netflix or Spotify Premium, and hopefully more useful. Also, don't forget that the Free version is still there and always will be. In the future, there will be a number of other awesome features to keep furthering my mission to make education better.